Mindy came to us in June 2002. The following day I let her go in the back yard so she could go back to her babies to feed them again. (The Doctor had assured me she would still produce milk.) Soon came the day when she came accompanied by her kittens who were very happy to be treated to regular meals. These kittens in turn were spayed/neutered and tattooed. One Friday night I looked out the front door and there was Mindy accompanied by one of her kitties. The strange part was that she had never come to the front door before, so I figured she must have a reason for this and I decided enough was enough, took them in intending to keep them safe in our house. Mommy and kitty had a wonderful weekend - until there was a knock at the door Sunday night. The neighbor had sent his neighbor, a policeman, to no doubt intimidate us, and he requested we return his cats because the mother was still nursing two or three other kittens in his yard. We brought mommy and her kitty back (I tried to put the kitten into the wife’s arms and she refused to even touch the kitten) and told him he must feed those cats so they would not have to go around the neighborhood looking for food. (He never even realized that Mindy had been spayed. Instead he pointed at her nice round belly [which got that way because for the first time in her life she had had regular meals] and happily announced that she was pregnant again.) He promised we would not "see the cat again". Well, he seemed to be feeding the cats because they never showed up again - until about 2 months later when I came home from church and happened to look over into the bushes in front of our porch. There, helplessly hanging from a broken rung of the trellis was our Mindy. She just looked at me silently imploring me to help her. She never made a sound. I got her down as quickly and painlessly as possible. Wrapped twice around her neck was a 2-1/2" man’s leather belt and attached to that was an electric cord which had become entangled around the bushes. Mindy has not left the house since except to go to the Vet. I took her in the next day and she was OK. Mindy, who used to climb the fence and make the trip across the yards when she heard us call has not turned her head to the sound of her name since. Like they say, you haven’t been ignored until you have been ignored by a cat. She does, however, have a great voice, which earned her the name Mrs. Quackenbusch! She loves to go to sleep in our laps or stretch across me when I am in bed. The story is not quite over, however. About 2 months after she came "home" for good I received a call from a lady asking me if I wanted my cat back. It turned out this was a lady who lived on a farm across the canal (we live near the Welland canal in St. Catharines, Ontario) way south of town. Her husband had stopped one day at his regular gas station and the owner asked him if he wanted to take this kitten home that had been hanging around the gas station for a few weeks. His guard dog kept chasing it. So the husband took pity on the kitty and took her home. It turned out they go to the same vet as we who discovered via tattoo that we had the animal spayed. Of course, I was only too happy to tell her she was welcome to keep the kitty especially since they had come to love her very much. It was obvious that one of the neighbors had gotten tired of the parade of cats and decided to take matters into his own hands and dumped them across the canal. This strategy seemed to have worked because there have not been any stray cats coming from that neighbor’s yard since. How sad, what happened to Mindy’s babies! Sadder still was the fact that not long after that, the Kitty got out of the house, ran into the road and got killed by a car where the husband found her that night when he got home! 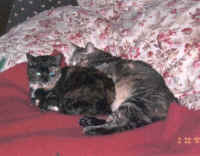 I never told Mindy about her kitties, so she is still a happy "Mrs. Quackenbusch". The path she trod as she crossed the backyard 5 years ago is still visible in the neighbors yard. Every now and then I go take a peak and I remember what Mindy and her kitties had endured.